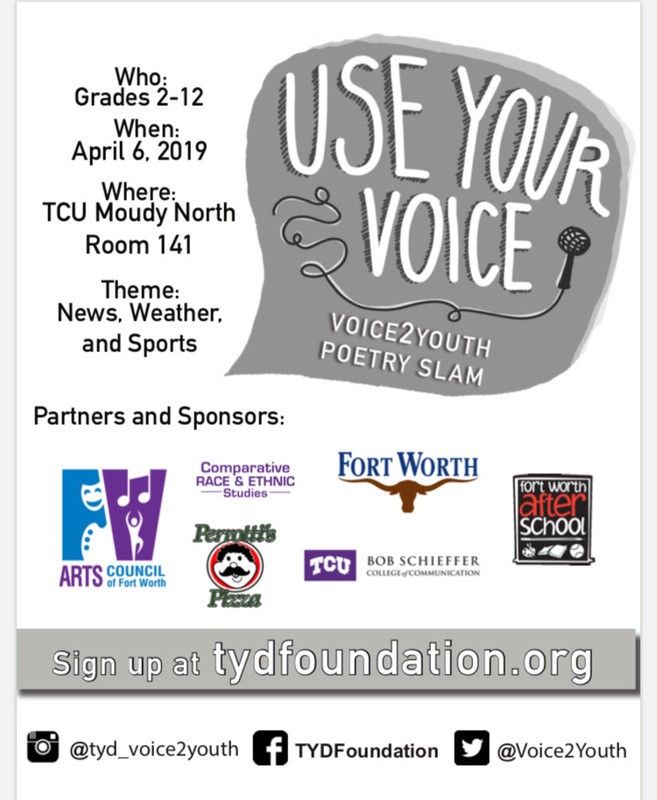 The 12th annual Voice2Youth Poetry Slam hosted students Saturday from under-resourced schools to perform their original poetry based on the topics of news, weather and sports. Educators and volunteers filled Moudy North with the goal of “building confidence, literacy and leaders” for the elementary through high school students who participated in the event. Students presented poems about President Trump, fake news, the border wall, depression and suicide among other topics. Strategic communication professor Broxon Sears’ capstone class partnered with the Thank You Darlin’ Foundation to help organize and run the event, as well as assist with public relations and advertising for the poetry slam. This year’s poetry slam was the first one to be held at TCU. “It gives them a way to show their voice,” said student and public relations manager for the poetry slam, Melanie Webb. A capstone strategic communications class in the Bob Schieffer College of Communication partnered with the Thank You Darlin’ foundation for this year’s event. West founded Thank You Darlin’ after her mother passed away, hoping to impact lives as her mother did. The effectiveness of the poetry slam can be seen in the success of the students who participate, West said. Brandon Sanders, a senior at Marine Creek Collegiate High School in Fort Worth, said he has been participating in the poetry slam since he was in third grade. During Saturday’s event, he was the only student to receive a perfect score for the solo performance of his original poem. The event helps students to not only express themselves, but also excel academically, West said. This idea proves true for Sanders, who will be attending the University of Houston in the fall. Nicole Hawkins is a journalism and political science double major from Tucson, Arizona. When Nicole’s not reporting, you’ll likely find her talking politics, iced coffee in hand.